Join influential fashion icons and media women, Michal McKay and Jillian Ewart in conversation with Claire Regnault, curator of New Zealand in Vogue, at Te Papa on 21 July at 6.30pm, as they recall the heady days of New Zealand fashion in the 1960s. Michal McKay, 2011. Image courtesy of Te Papa. At the tender age of 21 Michal McKay became the fashion editor of New Zealand Vogue after a three month internship at British Vogue, where she was ‘Voguerised’. She remained with Vogue NZ until 1967, when she left to pursue an international career in magazine publishing. A Pierre Cardin fashion parade at the Canberra Theatre Centre, 1967. Ladies levitating with no help from the photographer Lee Lin Chin. National Archives of Australia. 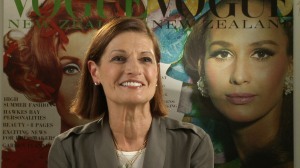 With a background in journalism, Jillian Ewart became the fashion adviser for the New Zealand Wool Board in 1965, and was the dymanic force behind numerous parades and campaigns which involved not only local designers, but visiting international celebrities such as Pierre Cardin who visited NZ and Australia in 1967, Miss World and Miss Wool America. Jillian subsequently moved into television, and was responsible for developing the format for the highly successful Benson and Hedges Awards for Fashion Design. What was it like in London in the swinging sixties, working with top fashion photographers like David Bailey and Helmut Newton? Going to the Paris Collections? Finding the right models for Pierre Cardin? Who were the tops models of the day? How has the fashion world changed? These are just some of the questions covered during the evening. For some behind the scenes info about New Zealand in Vogue visit Te Papa’s blog. This entry was posted in Exhibitions, Local events, Wellington and tagged Jillian Ewart, Michal McKay, New Zealand in Vogue, Te Papa. Bookmark the permalink.